It’s 0708 CST at the time of writing this. Bitcoin has decided to rally up further and touch the coveted 10k area. Ethereum has had some slow and clear profit taking and indecision on Ethereum traders. However, we have some great entry opportunities right at this time. Today we are looking at the ETHBTC pair. As a very simple explanation, this pair is essentially the strength of Ethereum VS Bitcoin. We have a fairly good entry point here on the 1-hour chart. Price did break below our up-trending line. However, the break and price action below it was not very impressive. There was certainly not a lot of effort to sell here. Also, the action doesn’t seem to indicate a stop run either, this may just be profit taking and new traders quickly entering positions that are coming against them. We are at an important harmonic level here. At the time of writing this analysis (0732 CST), we have formed a bullish engulfing candlestick on the 1-hour chart (this could change though!). We also see that the volume is around 80% of the previous bar. From a price action standpoint, we have the previous close and current low still above our harmonic level. From a purely technical standpoint this is quite bullish, but as always we want to confirm the close of the candlestick. I always like to see some divergence on a chart as part of my entries into trades but sometimes a firm rejection slope on the RSI from OS and OB levels is equally telling. We see a very strong rejection slope on the RSI. There may be some hints of divergence in the price action preceding the break of trendline on #1, but that is not very important to right now. It will be very interesting to see what ETHBTC does when Bitcoin breaks and/or tests the 10k level again. This is especially important for this crypto pair. Volume on the close of the current bar should be higher than the previous. Right now it is still below. I’ve mentioned before that volume is still something that I struggle with regarding cryptocurrencies: it doesn’t seem to matter at the moment. It seems to confirm movement as much as it doesn’t seem to be a factor in movement. We could have a very choppy ride with Bitcoin at and above 10k. This pair does not necessarily move like you would think a Forex pair would move (i.e., the EURUSD pair: if the dollar is weak the EURUSD goes up). Fundamentally with Bitcoin holding at 10k it could honestly lift up Ethereum as well and we would be in for a choppy right on this pair. 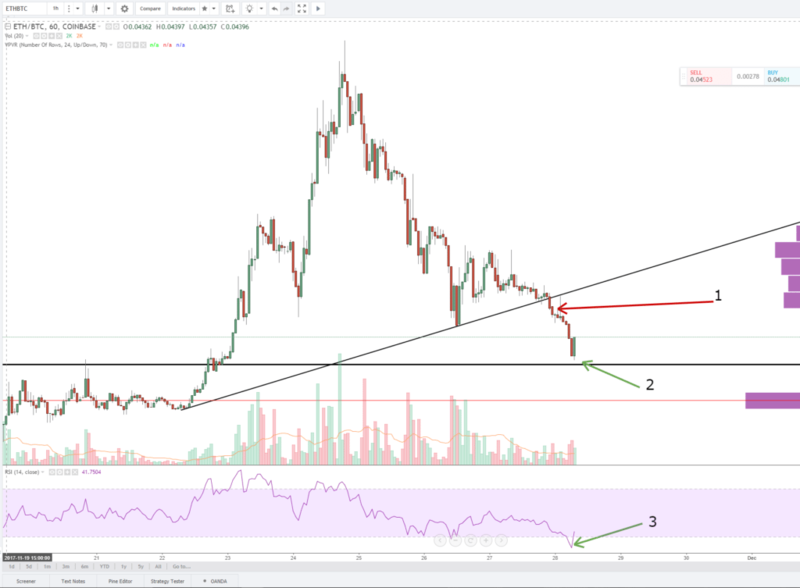 Be careful of our RSI levels. There is no major divergence currently that would signal a long, just the strong rejection slope from oversold levels. Remember, remember, remember: The RSI can remain in overbought and oversold levels for a long time! It does not mean a reversal is imminent! Taking trades solely off of an RSI level has been the undoing of a many a would-be trader!